Kim Jong-un’s Sister to Visit South Korea? A suggestion that Kim Yo-jong could be on her way sparks a surge in stock prices of related companies. Local South Korean media are suggesting that Kim Yo-jong, sister of North Korean leader Kim Jong-un, may visit South Korea in the near future. Kim was on a North Korean list of officials slated to take part in a joint food festival organized by a business group established by South Korean businesspeople with links to the North, an event official told Yonhap News Agency on December 4. If true, it would be the first visit to South Korea by a member of Kim’s immediate family. 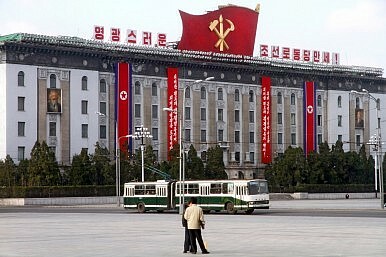 To date, the official closest to the North Korean power apex to have visited South Korea was Jang Song Thaek in 2002. Jang was purged and executed last year. South Korea’s Unification of Ministry has said nothing has been confirmed yet. The ministry added that it is true that Kim Yo-jong’s name is on the list, but cautions that it is not certain if this person is in fact the sister of Kim Jong-un. The ministry added that the proposal for the event submitted by the business group was somewhat different from the proposals normally received from the North, and that it would be check to determine if the proposal really was from the North. The ministry also pointed out that the title given to Kim Yo-jong on the list was odd. According to the ministry, Kim’s title on the list (as of October) was “departmental director,” while North Korean state media was referring to her in November as a departmental vice director within the party’s central committee. Kim’s name had rarely emerged as a key figure in the North until Korea Central News Agency’s report came out. At the time, experts said she was becoming an increasingly important figure in North Korea, as a member of Kim’s family with a role in running the country. They speculated that she might take on the role of her aunt, Kim Kyong-hui, who had closely supported former North Korea leader Kim Jong-il. Meanwhile, the news of Kim Yo-jong possible visit to the South has sent the stock prices of businesses that are involved in economic cooperation with North Korea surging, on expectations that inter-Korean relations could be improved with Kim’s visit. As of 10 a.m. today, the stock price of Emerson Pacific, which runs a golf club in North Korea, was up 5.45 percent from yesterday, while that of Hyundai Merchant Marine Co. had risen 4.15 percent. Hyundai Merchant Marine Co. owns Hyundai Asan Co., which runs a tourism business in Kumgang Mountain in North Korea. Jaeyoung Solutec, one of the businesses operating in the Kaesong Industrial Complex, saw its stock price climb 14.75 percent. A Generational Shift in Pyongyang: Is Change Ahead?An Olympic Feat: North and South Korea Engage in High-Level TalksKim Jong-un Elevates His Sister to Worker's Party PolitburoSouth Korea: You’ve Come A Long Way, Baby!Why Was Kim Jong-un's Older Half-Brother Reportedly Assassinated?